Once upon a time, I sat in my little chair by the window on New Year’s Eve to write some serious resolutions. I had high aspirations, I would have you know. Only one piece of candy per day. Exercise four times per week. Catch up on three years’ worth of that dreaded unfinished craft project. Of course, Scripture reading, prayer, and Scripture memory were always included because I had failed so miserably the year prior. But like everyone else’s New Year’s resolutions, they lasted about a month at best, and then were adjusted, avoided, or simply forgotten. Several years ago, I was challenged to memorize one chapter of Scripture in one month’s time. Now this was a challenge I could handle. And one I came to quite enjoy. And now, it’s my favorite New Year’s resolution, because it only lasts a month. 1) Print a copy of the chapter so that you can carry it around with you. 2) Find 2-5 minutes each day to memorize one verse (e.g. verse 1 on day 1, verse 2 on day 2, etc.). 3) In addition to memorizing one verse for the day, review all verses previously memorized, such that you can recite all verses word-for-word until you reach the verse of the day. 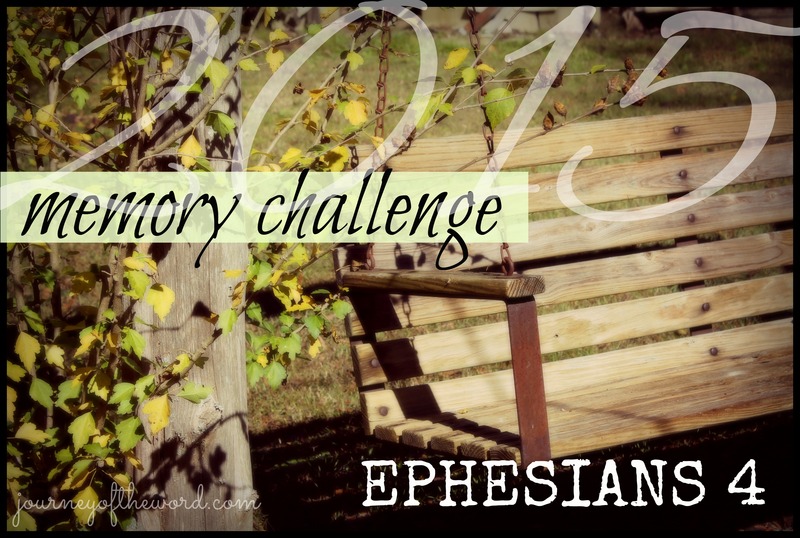 This year’s Memory Challenge? Ephesians 4. That’s one verse a day if you start tomorrow. I have been studying the book of Ephesians with a friend for the past four months, and wow, it’s an amazing book just loaded with precious truth. And chapter four is a solid slice of it. Even if you haven’t had the opportunity to study Ephesians 4 in-depth, I think you’ll be encouraged, strengthened, and challenged by what it has to say as you repeat it again and again, ponder its words, and let it all sink in deeply. You’ll find beautiful reminders of what Christ has done and who we are as a result. And admonitions that convict and equip. Swallow slowly. Spread the word. Let’s get a bunch of Eph4-memory-challengers on board and encourage one another to press onward. Leave a comment if you’re joining the fun. And stay tuned for a follow-up post at the end of the month. Special stuff just might happen. Great way to start the year. And the best New Year’s resolution you’ll ever actually complete. Sounds awesome! I will enjoy memorizing what we have studied, this is a passage that can be used in our lives over and over again. My mom is also joining. Happy memorizing! Yay! So glad that you and your mom both are joining the challenge! Absolutely! So glad you’re participating! 🙂 21 hours in college?! Yikes! Sure sounds like you’re busy. Hope your semester goes well. So glad you’re joining the challenge, even if it at your own pace. 🙂 Keep it up!